Anthony Martial produced a magical moment of individual class as he scored Man Utd’s second goal in the opening 25 minutes against Fulham. United had taken the lead through Paul Pogba after just 14 minutes, and it wasn’t long before they doubled that advantage. 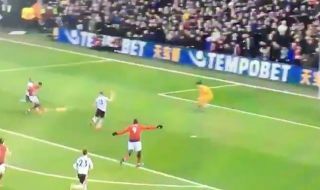 After dispossessing Fulham and sparking a counter-attack, the ball found its way to Martial on the halfway line and he didn’t need any help as he produced a wonderful mazy run to get away from his marker before skipping past the last man and bearing down on goal. The Frenchman showed great composure to steady himself and apply the finishing touch to what was a simply brilliant individual goal, as seen in the video below. Ole Gunnar Solskjaer has undoubtedly got his attacking stars playing with a calmness and with confidence, and that’s being reflected in their goalscoring and results. A win over Fulham would temporarily at least move them above Chelsea into fourth place in the Premier League table.